Mondo Polymer Technologies warranties all of its products (Mooring Products � see below) to be free from defects in workmanship and material under normal use, service and when used for the purposes and under the conditions for which they are intended. Mondo Polymer Technologies warranty will not cover any product if overinflated, cut, punctured, damage from animals, exposure to chemicals which cause the product to breakdown or discolor, intentional misuse, acts of god and any flaws caused by normal wear and tear. Mondo Polymer Technologies will replace the defective product, with one of equal value, after receipt of defective product and determination of failure is deemed to be the result of defects in workmanship and/or material failure. No return will be accepted without prior approval. Mondo Polymer Technologies shall not be liable for any damages either direct, indirect, incidental or consequential and does not assume any liability of purchaser or owner to others property or personal injury. 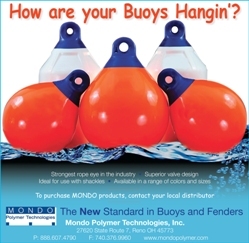 Mondo Polymer Technologies warranties all of its Mooring products to be free from defects in workmanship and material under normal use, service and when used for the purposes and under the conditions for which they are intended, for a full three years from date of purchase. Mondo Polymer Technologies warranty will not cover any Mooring product if overinflated, cut, punctured, damage from animals, exposure to chemicals which cause the product to breakdown or discolor, intentional misuse, acts of god and any flaws caused by normal wear and tear. Mondo Polymer Technologies will replace the defective product, with one of equal value, after receipt of defective product along with original sales receipt and determination of failure is deemed to be the result of defects in workmanship and/or material failure. No return will be accepted without prior approval. Please include letter with reason for return, name, return address and sales receipt (for Mooring Products).